Bigasoft WebM Converter for Mac is a powerful WebM/VP8 encoder as well as a professional VP8/WebM decoder. It can create and convert any video format including MP4, MOV, AVI, 3GP, FLV, H.264, MKV, WMV, RM, RMVB, VOB, Xvid, DivX, HD, and more to HTML5 supported WebM/VP8 format on Mac OS X. It can also convert WebM/VP8 to any other video format. Besides it can extract audio from WebM file and any other videos and save as OGG, MP3, AAC, AC3, etc. 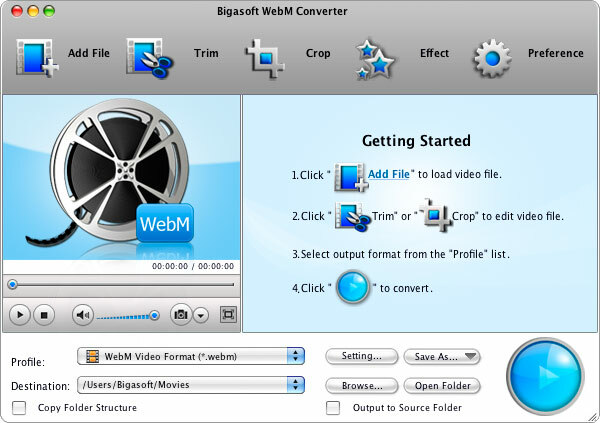 In the same time, Bigasoft WebM Converter for Mac can decode and convert WebM/VP8 to any other video format including MPEG-4, H.264, Xvid, DivX, DV, HDV, HD, AVCH, MTS, TS, MP3, OGG, AAC and MP2 etc. And it even can extract audio from WebM/VP8 and then save as OGG, MP3, AAC, AC3, WAV, WMA, and more. Qweas is providing links to Bigasoft WebM Converter for Mac 3.5.10.4312 as a courtesy, and makes no representations regarding Bigasoft WebM Converter for Mac or any other applications or any information related thereto. Any questions, complaints or claims regarding this application Bigasoft WebM Converter for Mac 3.5.10.4312 must be directed to the appropriate software vendor. You may click the publisher link of Bigasoft WebM Converter for Mac on the top of this page to get more details about the vendor.